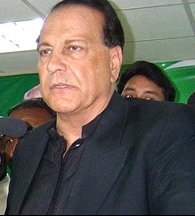 Governor Punjab Salman Taseer is assassinated in Islamabad near Kohsar Market. One of his guards shot him with gun firing. Murderers name is Mumtaz Qadri, according to News Channels. He belongs to Elite Force. 9 bullets are fired at Governor Punjab SalmanTaseer. Salman Taseer was admitted in Poly Clinic’ Emergency but his life could not be saved. 6 Guards including Qadri has been arrested by Islamabad Police, Kohsar Police Station. Forensic Evidences and Crime Scene are being taken by concerned Security Agencies. The killing of Salman Taseer is the most high-profile assassination of a political figure in Pakistan since the assaination of former Prime Minister of Pakistan Benazir Bhutto in December of 2007. Governor Punjab Salman Taseer met with Qamar Zaman Kaira last time today. Asif Ali Zardari, President of Pakistan is informed during a meeting. Asif Ali Zardari terminated all his current activities after this incident. It is being reported by News Channels that Governor Punjab is killed due to his statements about Tauheen-e-Risalat Act of Pakistan, as said by the assassin.